2 bed, 2 bath unit, Annual Floating Use, Platinum Season. This owner has 2 weeks. Will discount the price to sell 2. For over fifty years Ft. Lauderdale in sandy, sunny Florida has been known as the best place to vacation on Florida’s fabulous Gold Coast. The beach is wide and deep, with soft, shimmering sand, and the night life is amongst the best in all of America. There is no better way to spend a relaxing vacation in Florida than in one of Marriott's BeachPlace Towers timeshare resale villas. These timeshares for sale give you easy access to everything Ft. Lauderdale has to offer without sacrificing the comforts of home. Experience Florida from Marriott's luxurious BeachPlace Towers timeshares and you'll never want to leave. 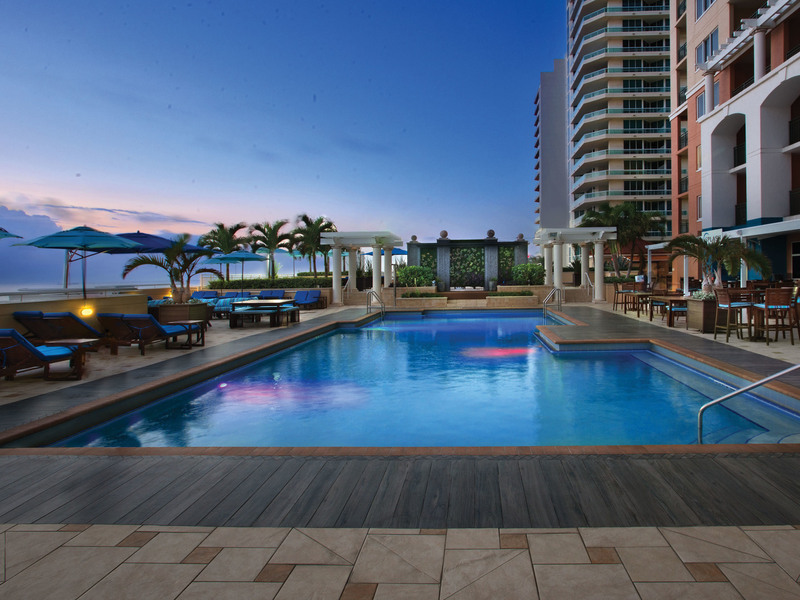 The perfect place to experience all Ft. Lauderdale has to offer is the Marriott’s BeachPlace Towers timeshares, a gleaming timeshare hotel that rises above Beach Place Mall, across the street from the Atlantic Ocean. Every one of the 202 rooms has a large balcony view of the turquoise waters of the ocean to the east and the Intracoastal Waterway to the west. These seas are the home to luxurious yachts and the fastest racing boats on the turbo-powered Thunder Boat circuit. Marriott’s BeachPlace Towers offers timeshare resale villas with different views, any one of which is perfect for whatever your family's needs are. Choos from multiple bedroom options, two bathrooms and a full kitchen when looking to buy your BeachPlace Towers timeshare resale. Marriott’s BeachPlace Towers is both a timeshare complex and a modern hotel, open to the public. Timeshare owners and tourists alike get to share in the vacation oasis that is the Marriott’s BeachPlace Towers. Timeshare owners make their units available throughout the year. From the moment you check- in, until you start to unpack in your luxurious two- bedroom, two- bath villa, you will be enthralled with the ambience and comfort that surrounds you. For starters, your villa includes a large master bedroom suite with a king bed and a deluxe guestroom with a queen bed. Two sofa beds in the living area afford great sleeping space for kids and friends. The kitchen has everything you need for breakfast, lunch and dinner, including a refrigerator, stove, utensils and dishware. Once you walk around the complex you will encounter all that a great resort has to offer. The outdoor heated pool is perfect for a dip any time of the year, day or night. Or, jump in the Jacuzzi for a relaxing whirlpool of gentle, warm water and take along your rum runner to sip on. The Marriott’s BeachPlace Towers timeshare facility offers an on-site gymnasium, tennis courts, guest laundromat, ATM machine, currency exchange and a concierge desk. Your concierge will be able to direct you to a variety of fun and events that are all within a few miles driving distance of the Marriott’s BeachPlace Towers. Jump in the car and within minutes go jet skiing, biking, bowling, sailing, scuba- diving, snorkeling and parasailing. There are tons of nearby attrations that will keep you and the family entertained and discovering new things the whole trip. Butterfly World teaches the whole family how butterflies grow and live and turn into the fabulous multicolored creatures you see in the summertime. The Miami Seaquarium is full of water shows and performing dolphins and pool acrobats. At Boomers, the go- karts circle the track in a frenzy, and the bumper- boats are nothing but laughs a good time. Batting cages let you test your skills at all speeds of pitching, and mini golf is never a bad place to try out your putting. The Museum Of Discovery and Science contains over 200 interactive exhibits where you can explore and view shark habitats, coral reefs, 12 foot snakes, alligators, and a winding nature trail. The nightlife around Ft Lauderdale and the Marriott’s BeachPlace Towers is unrivalled. Take a water taxi over to famous Las Olas Boulevard where Connie Francis filmed “Where the Boys Are,” and go bar hopping. Restaurants dot the street on both sides. The yellow tail snapper and blue martinis are to die for. Experience the culinary expertise of Ft. Lauderdale during your vacation at Marriott's BeachPlace Towers timeshres. Shula's on the Beach is named for the legendary coach of the Miami Dolphins, and his son manages the restaurant. The steaks are huge and steaming, served on hot metal plates, and the restaurant offers a selection of well over a thousand bottles of fine wines. Mango’s is a wonderful family restaurant, with everything from lemonade and juicy hamburgers to beer and medium rare steak sandwiches smothered in onions and mushrooms. Max’s at Beach Place if always fun for an adult crowd with its large bar and glass shelves lined with liquor from all over the world. The Quarterdeck is a sports bar where all the college and professional games are shown throughout the day. If you want something a bit more pricey but succulent, Florida’s famous Charley’s Crab has the most exotic shrimp, crab and fish dinners found anywhere in the Sunshine State. If you want absolutely everything the tropics has to offer, look no further than the Marriott’s BeachPlace Towers timeshares in the legendary center of entertainment, Ft. Lauderdale, Florida. There is nothing you can wish for at a holiday timeshare retreat that Marriott’s BeachPlace Towers doesn’t have. Right now, the Marriott’s BeachPlace Towers timeshare deals are priced right and at a lower rate then they have been in years. For any owners looking to sell a BeachPlace Towers timeshare, the brokers at Premier Timeshare Resale can match you up with a buyer. Fractional ownerships in Marriott’s BeachPlace Towers are an excellent way to spend a short vacation at one of Florida’s premier destinations each year at a cost that meets your budget.